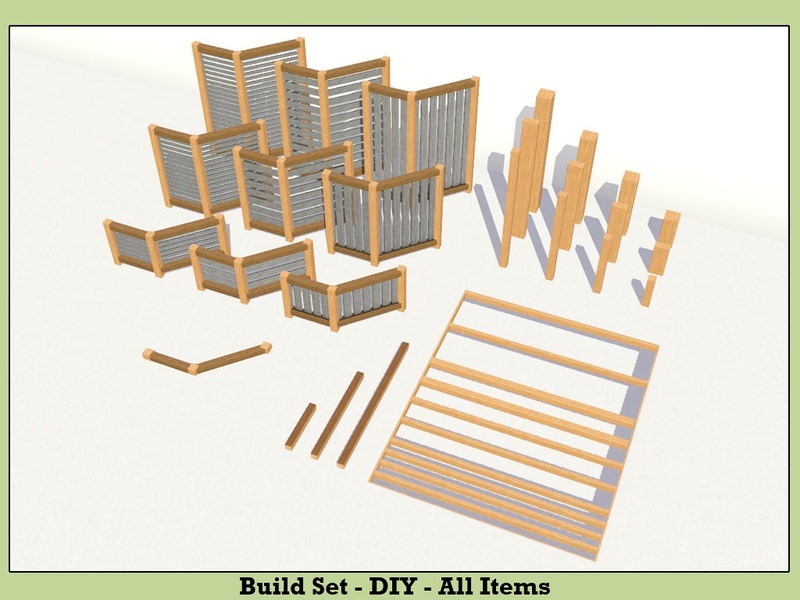 Mod The Sims - Build Set - DIY UPDATED 10th Sept. 2012! One should never touch meshing programs! This set got started when I wanted to make a proper fullwallheight column to use in my game, that would tile seamlessly when put on top of itself. That one was relatively fast to make, but was I happy? No! I needed to make other heights, that would work with CFE'd walls. So I made those variations. Then it hit me. Beams! I have always loved how you can shift stuff up and down on walls, so I made a beam that could do the same, to go with the columns. Was I happy with what I made again? No! I had to make two other sizes. So now I had 4 columns and 3 beams to go with them. 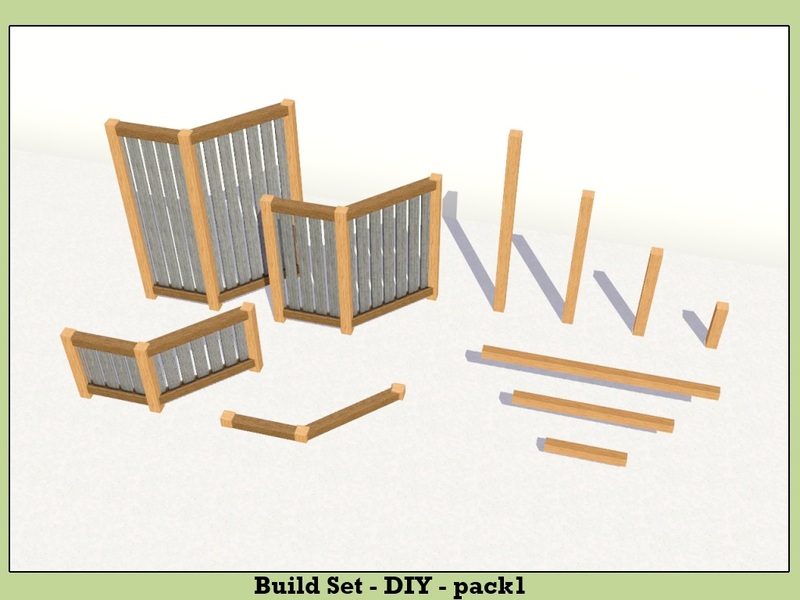 I wasn't still satisfied, something was missing, and then I thought - Why not make fences, I have never made any. So I took a dive to mysterious world of fence making. It took a few tries, but soon I had a nice counterheight fence, that worked nicely with both the columns and the beams. 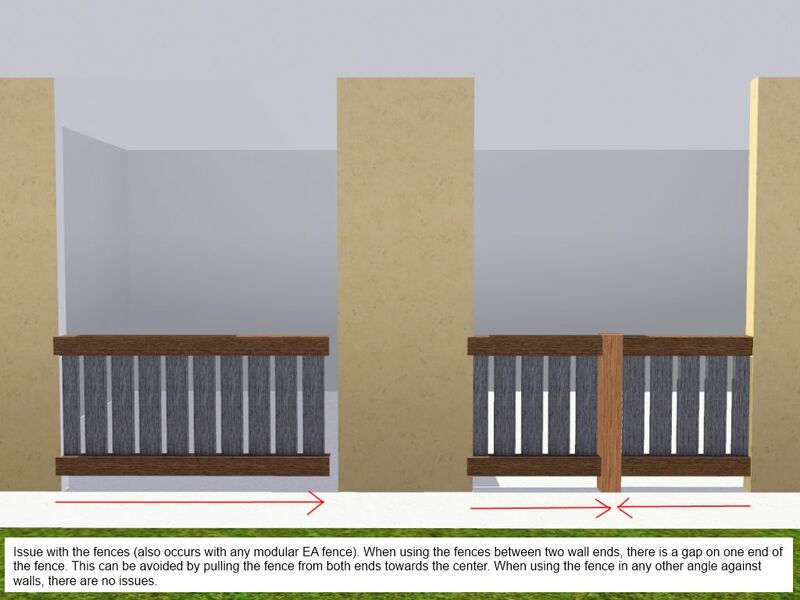 So once again, I had to make more variations - Resulting 2/3- and fullwallheight fences. As a stubborn person, I had to make more fences of course, but this time with horizontal planks. So I made 3 fences with thick planks. Then I wanted ones with narrow planks, and made those too. About half the time I was Skyping with Tom and Kayla, and occasionally also Qbuilderz. Tom was bugging me all the time with requests for roofing fences and different columns, but I told him that I might do them at some point. Then Q started talking about roofing fences too, so I thought, I guess I can make some. So I started exploring how to make the roofing fences, and to make it more difficult, so that they would be floor level and -height. I made one version, showed it to the guys, and they liked it, so I made 4 other versions too, to make it more interesting. Then I thought, why not make Tom the columns he so much wants, so I did those too. Then, at the end when I had all the packages done, Dal and Lee poked me about combining the packages. So I did so, thanks to them for the idea! Please press the button to show all object information! Here is a picture of all items in the set. And here are the names, prices, locations where to find, channel info, and what texture packs you need for each group. Is told above, but I will repeat. NEVER EVER USE THE ROOFING FENCES ON GROUND!!! You will be unable to delete them later if you don't hit undo straight away - they will be underground. The beams are shiftable. Just place, hold ALT and drag to desired direction. Some of the objects require MoveObjects On -cheat to be placed everywhere you want (Does not include fences). Please also see first comments for more pics and info about the object types individually! All of the items are Base game compatible. To be able to shift the beams up and down you also need patch 1.17/2.12/3.8/4.5/5.2/6.0 or higher. What to download, please read carefully! 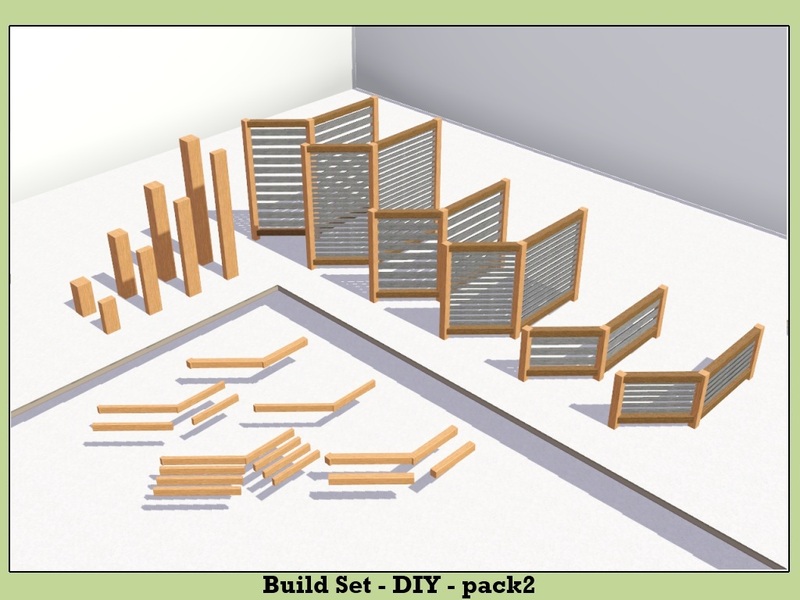 If you want all of the items, download both armiel_Build Set - DIY_pack1 and armiel_Build Set - DIY_pack2. 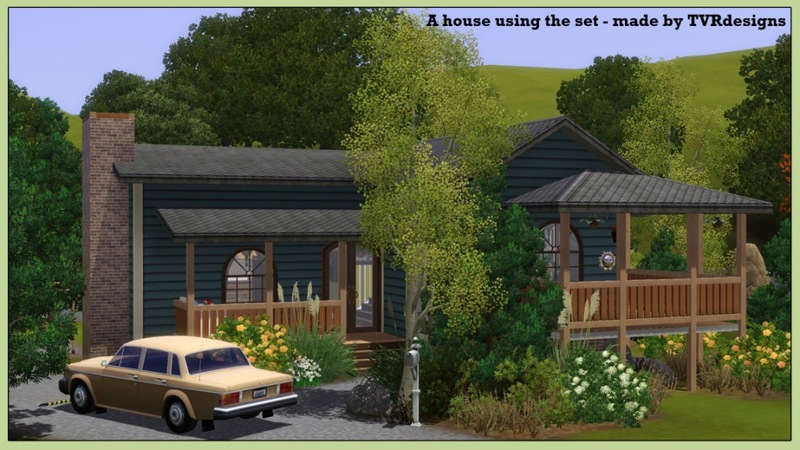 These include all the objects and texture files. You can also choose just one of these. 2. 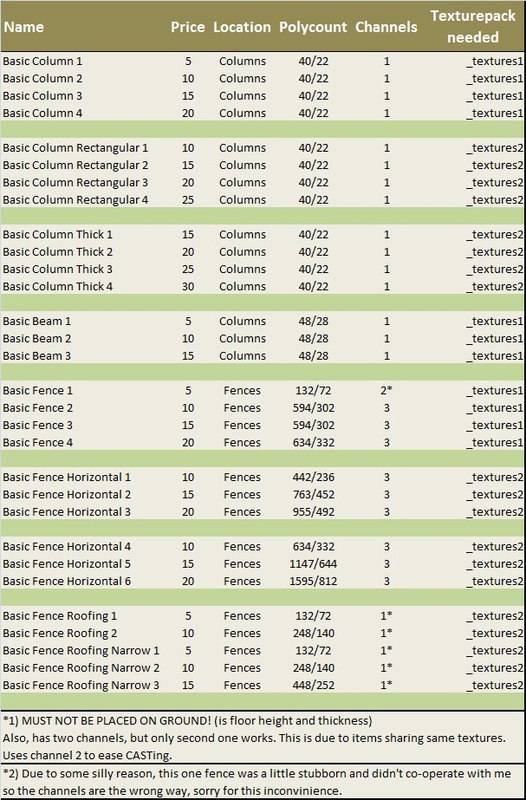 Basic columns rectangular and thick, -fences horizontal narrow and thick, -fences roofing. - There are 2 texture files. Without these items WILL NOT WORK, cause the textures are linked to reduce filesizes. - The rars have a number at the end of their names. These tell you which texture packs you need to download. Lee, for poking me to make all the items to use same texture files by linking them. Inge and OrangeMittens for helping with changing the names and descriptions afterwards. Kayla and Tom, for hours and hours of listening me whine. 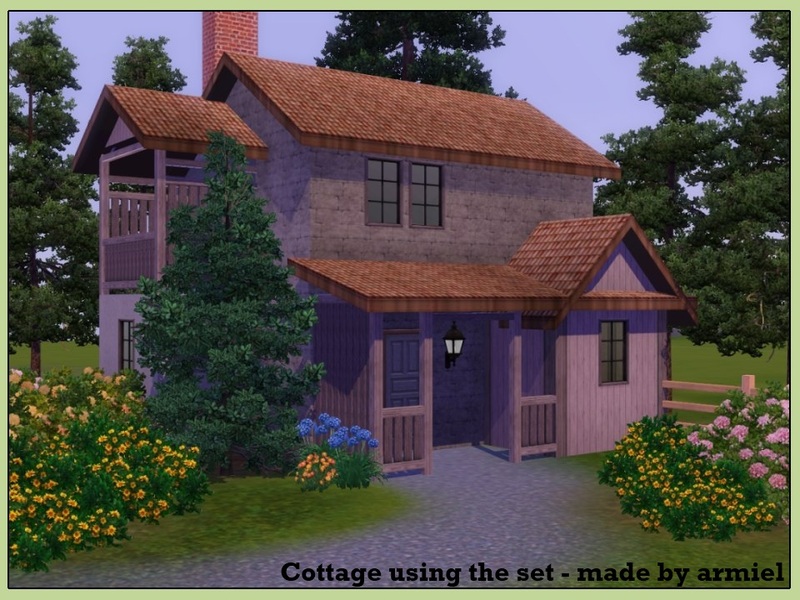 Tom also for making me the cute cottage picture for upload using my items! Kayla, Dal and Traelia for testing. Dal and Lee also for mentioning combining packages. #create, Whitey, HP, heaven, levini, adrisole, and everyone else that might have commented on them. Terribly sorry if I forgot someone. and finally Skype, a great place to whine!! Woooops, the beams had the white issue too. A FIXED file has been added. Same instructions as below. Sorry 'bout this hassle. I FINALLY fixed the basic columns, which had some -whiteness- issue when you viewed them off-lot/in edit town/in CAW. Download it and extract it to the same folder you put the original files. It will ask you to overwrite - do so. Then clear your caches, and you're ready to use them! When you load the game, every basic column you had placed has been replaced with fixed pretty version. Please note that the combined part1 containing multiple parts of the set is still the same, so you need to get the columns fix, too! armiel_beams_1.rar | Description: This is outdated, do not download! armiel_columns_normal_1.rar | Description: This is outdated, do not download! 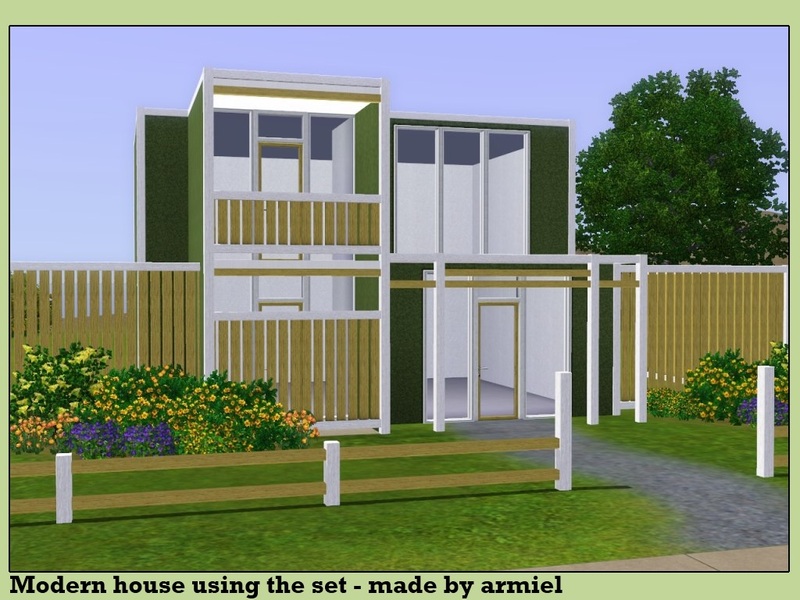 armiel_FIXED_columns_normal.rar | Description: Fixed basic Columns, please download THIS file instead of original (has been marked). Remember you also need this if you get full set part 1, and you also need to get textures 1 if you get just this file! 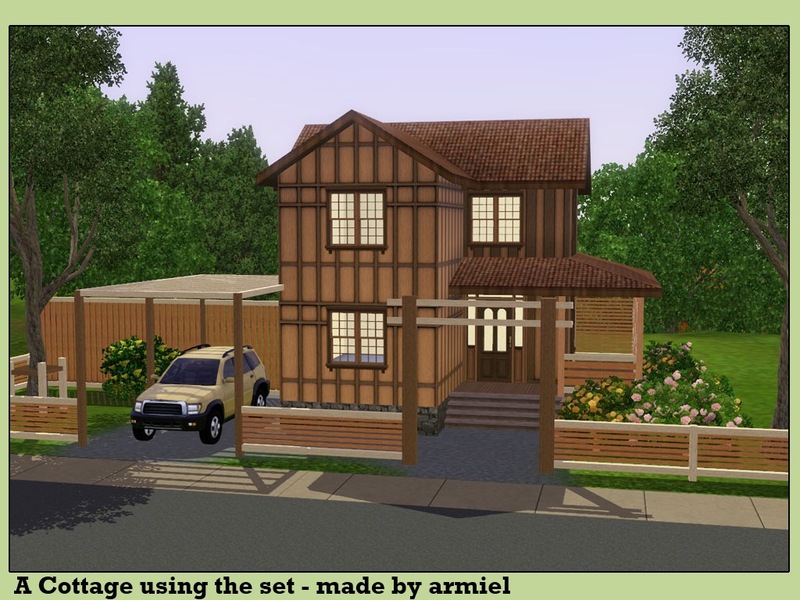 armiel_beams_FIXED.rar | Description: Fixed basic Beams, please download THIS file instead of original (has been marked). Remember you also need this if you get full set part 1, and you also need to get textures 1 if you get just this file!